Now the evenings are getting cooler and the afternoons shorter, I’m finding I’m cooking more casseroles, bakes and slow cooker dinners. I love these types of recipes as I usually double it so I can eat some of what I make and freeze the rest for dinner another night. 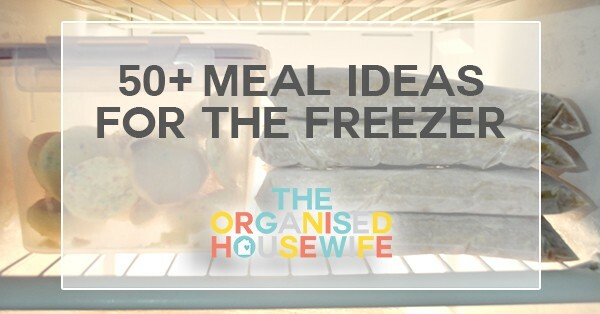 Please share with me in the comments below – What are your favourite meal ideas for the freezer? 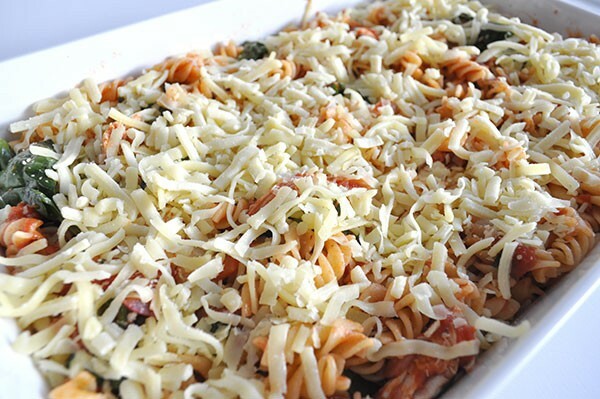 Time – doing a double batch of dinner is hardly any extra effort, then you feel like you have the night off when all you need to do is reheat. 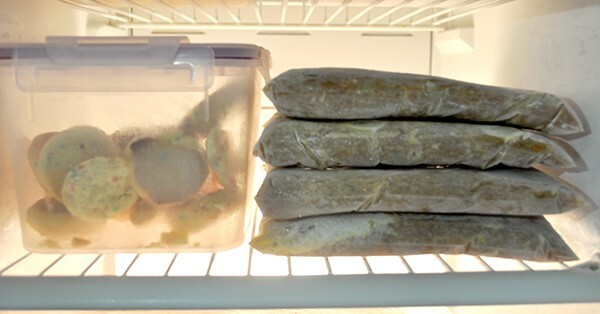 Convenience – if you know you won’t have time to cook dinner, take something out of the freezer to defrost. 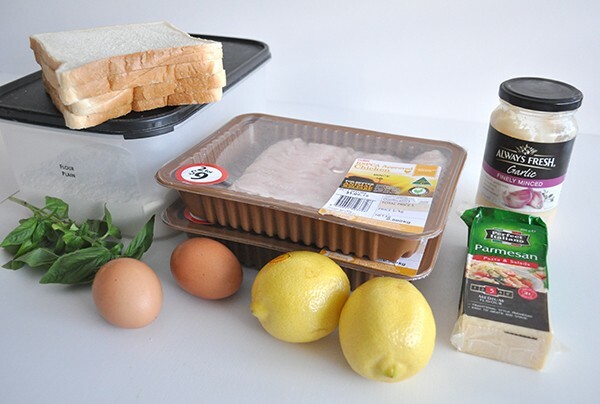 Nutrition – being that you made it yourself, you can control the ingredients, having a meal ready in the freezer will deter you from purchasing takeaway. Save money – if you find a great cut of meat on special buy in bulk and save. Plus having meals in the freezer is more cost effective than takeaway. Help others – you can grab a meal from your freezer and give to a friend who is ill, having a hard time or had a new bub, they will truly appreciate the gift of food. Temperature – It’s important to freeze all foods at 0° or lower to retain vitamin content, colour, flavour and texture. Undercook vegetables slightly – When cooking to freeze undercook vegetables so they are still a little crunchy. When you defrost and reheat they will have a better texture. air tight glass storers – airtight and leakproof glass containers so they can go from freezer, fridge and into the oven or microwave (with lid removed). These are great for dishes that just need to be reheated. 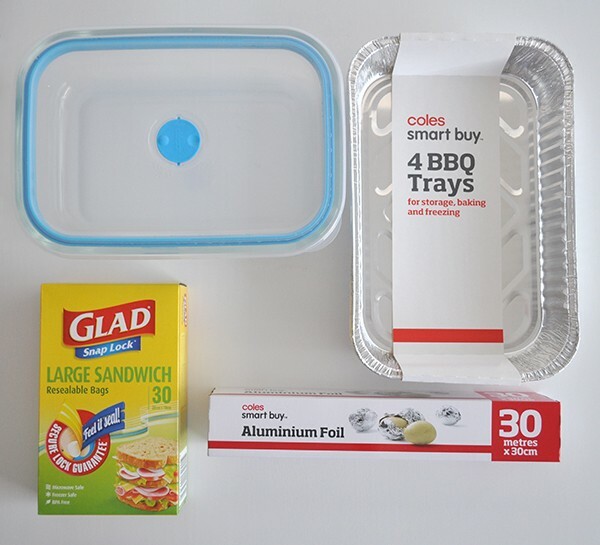 foil trays – I store my rissoles and some bakes in the tray, as I don’t have too many glass storers and if i want to give a meal to a friend they don’t need to return the tray. I cover the trays with alfoil if they don’t come with a lid. You can also get smaller trays from the dollar stores. I like to have meals in the freezer for those nights I know I won’t have time to or the weeks I don’t have time to do a full shop. It’s also beneficial for the weeks you know you don’t have enough money for a regular grocery shop. 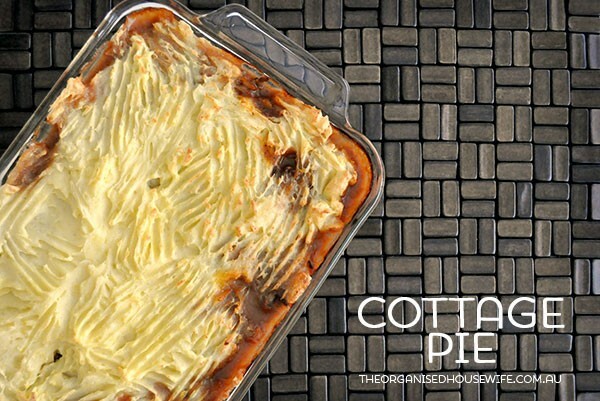 When freezing shepherd’s and cottage pie, assemble by adding your mince to your glass dish or foil tray, top with potato and cheese if required then cover and place in freezer. Remove from freezer the night before, defrost in fridge during the day, place in 180°C for 30 minutes (or 45-60 minutes if still frozen), bake until golden. I like to make my own rissoles and when I do I usually cook a double batch, enough for that night’s dinner and freeze the rest. They can be served with vegetables or on rolls as hamburgers. Lemons, limes, oranges… all citrus is in season at the moment so I couldn’t go past trying this Lemon, Chicken and Parmesan Rissole recipe. The lemon gave the rissoles a deliciously fresh flavour, the kids really enjoyed it with sweet chilli sauce! You could also add in some extra fresh vegetables to the recipe, like carrot or zucchini. 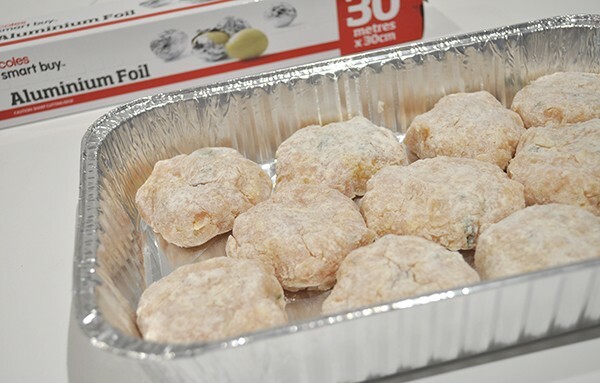 I freeze the rissoles uncooked, covered with alfoil in a foil tin. Take them out of the freezer the night before, then brown them in a frying pan 2 minutes each side and pop them in the oven for 8-10 minutes to cook through. No hassle at all. What meals do you like to cook up and store in the freezer? Absolutely – just salmon mornay with chopped cooked chicken and bacon in place of the salmon 🙂 And I usually add french onion soup mix into it too….yummy! We’re huge fans of the freezer. I work really long days and don’t have time to cook when I get home so our freezer is full of curries, meat pies, cottage pies and bolognaise and chilli. I love your list because now I can add a few more things to my repetoire! we had the cottage pie with sweet potato last night, was so delicious! How does your mashed potatoes defrost! I thought potatoes didn’t freeze too well? Thanks for the recipies. Thank you so much for these freezer ideas – my days with little kids and a baby are hectic so this takes away some time spent on trying to think of healthy dinner ideas! happy to help Karina, bolognese and rissoles are always a great start! I freeze muffins and unbaked cookies also. A tip for freezing meals is to freeze leftovers – even if there is only a single serve. These are great for lunches – or – every now and then we’ll have “freezer finds” for dinner which means that each person may be actually eating a different meal as I am using up all the single serves from my freezer. My DH is working away from home at the moment. The other night I made a large Butter Chicken as my grown up DS and his partner were here for dinner (the younger kids had chicken strips as the Butter Chicken was too spicy for them)- I froze the remaining Butter Chicken & Rice into 4 X Single Serves. When I’m on my own with the little ones and crave something spicy – I will prepare nuggets and veggies for the little kids and I’ll enjoy my spicy butter chicken. Love your way of planning, Julia! You sound very similar to me! I always make double batches of muffins or banana cake and frreze half ( I slice the banana cake and butter each slice first and put in packs of 2 slices) , also freeze cooked pinwheels (potato and pizza). this makes linches easy. I also make a double batch of bacon and vegie slice, one big dish and the rest in ramekins which are great for work lunches. Premade Meatballs and rissoles are in freezer also. Makes life much easier. Pumpkin soup and pea and ham soup also. They’re like a meat pattie (for a burger), except we eat ‘rissoles’ without the burger and perhaps with gravy, mash and veg – a very old fashioned, but much-loved meal here in Oz! You can, of course, use it as a burger pattie, also! Perfect timing! I have just done another big kitchen day today. Triple batch of Lentil Bolognese, 2 big vege lasagnes, bag each of chicken, lamb and pork in marinade, 3 bags of cheese rolls, lots of fritters, and a swag of smoothie bags. Have mince and vege mince cooking right now for tacos tonight and enough left over for 2 more meals. My favourite is the smoothie bags. Spinach, banana, berries and various bits of fruit into sandwich bags – makes much better smoothies from frozen. Will be adding some of these recipes to my list for next time. Ooh lentil bolognese that sounds delicious! I have never heard of it before! Love, love, love it. Inspired much!!! These are so handy thank you. 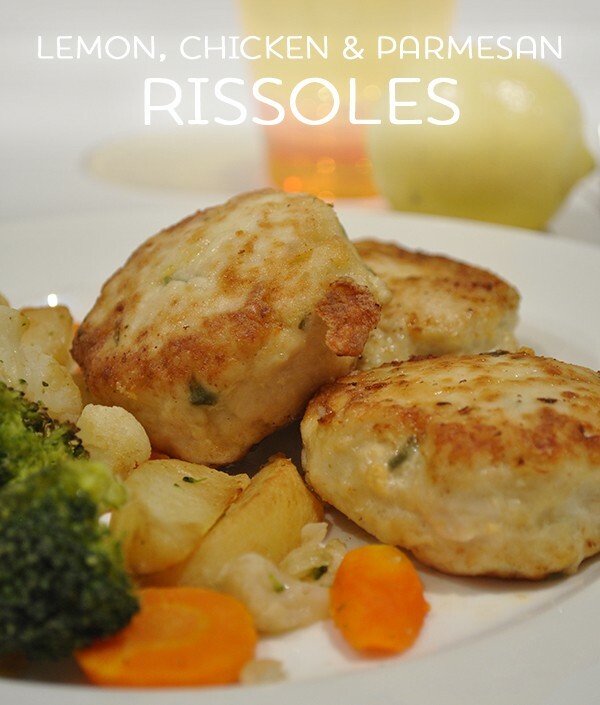 I’m going to try the lemon chicken rissoles this week. You have inspired me to sort out my freezer as I have no space at the moment but I do have a lot of bolognaise in it! Awe happy to help, Vicki. :) I must admit the lemon rissoles were super tasty! I like to make double batches of things like turkey tetrazzini, sausage & rice casserole, stuffed pepper cups, and tallerini and freeze in meal-sized portions. 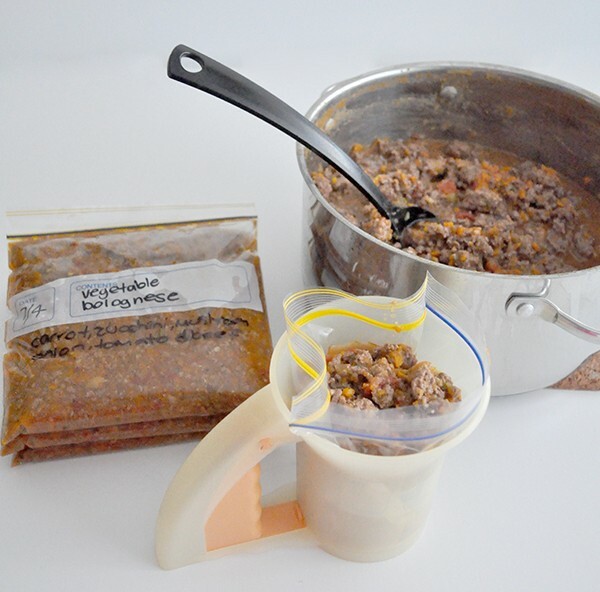 I also like to brown ground beef with onions and peppers and freeze in recipe-sized portions for a quick start on things like Sloppy Joes, spaghetti, and other favorites. Since I have fibromyalgia, it is easier for me to make smaller batches of things when I am feeling well and then just pull something from the freezer during times when I am in a great deal of pain. Great list. I must get better at cooking and freezing meals. It would certainly make my life easier at times. My kids love meat balls which is so easy. I often make two sandwich loaves of sandwiches on Sunday afternoon. I keep them seperate by a square of paper between one sandwich and the next then stack them back in the bread bag to freeze. We either toast them up in a panini press, or grab and go for instant lunches. Loving your ideas! Going to make the lemon rissoles tonight! I was just wondering how does potato freeze. as in cutting up all raw ingredients put them into the same bag to freeze. I get my meat from our farm so i can only freeze the veggies in meal sizes. My husband and I both work 12 hour days, 5 days a week and travel 1.5 hours to and from work. On top of that we both study and are committed to heavy training (good nutrition is so important in preventing burn-out!). Every weekend I fill our BIG freezer with meals so if a fresh-cooked meal just isn’t possible, we don’t start relying on take out. Snacks are always available but I can portion control and keep it healthy. Clean up is easy too! We’d be lost if weren’t for freezer friendly recipes. Thanks for contributing to our collection and for the storage & defrosting hints. Legend! Hi Alycia, you sound so busy, and quite a lot of commuting I can understand why you need to fill your freezer. What is your favourite freezable dinner?